The New England Journal of Medicine (NEJM) is a weekly medical journal published by the Massachusetts Medical Society. It is among the most prestigious peer-reviewed medical journals as well as the oldest continuously published one. January 1814 edition of the Journal. In September 1811, John Collins Warren, a Boston physician, along with James Jackson, submitted a formal prospectus to establish the New England Journal of Medicine and Surgery and Collateral Branches of Science as a medical and philosophical journal. 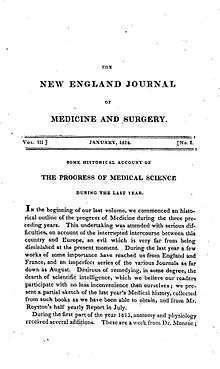 Subsequently, the first issue of the New England Journal of Medicine and Surgery and the Collateral Branches of Medical Science was published in January 1812. The journal was published quarterly. On April 29, 1823, another publication, the Boston Medical Intelligencer, appeared under the stewardship of Jerome V.C. Smith. 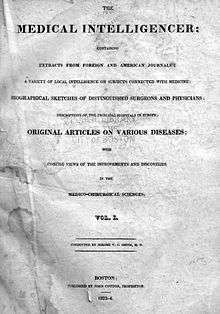 The Intelligencer ran into financial troubles in the spring of 1827, and the editors of the New England Journal of Medicine and Surgery and the Collateral Branches of Medical Science purchased it in February 1828 merging the two publications to form the Boston Medical and Surgical Journal, published weekly. The Massachusetts Medical Society purchased it in 1921 for $1 and renamed it in 1928 the New England Journal of Medicine. The journal’s logo depicts the Rod of Asclepius crossed over a quill pen. The dates on the logo represent the founding of the components of the New England Journal of Medicine: 1812 for the New England Journal of Medicine and Surgery and Collateral Branches of Medical Science, 1823 for the Boston Medical Intelligencer, 1828 for the Boston Medical and Surgical Journal, and 1928 for the New England Journal of Medicine. February 23, 1928, cover of The New England Journal of Medicine. First use of present name. In November 1846, Henry Jacob Bigelow, a Boston surgeon, reported a breakthrough in the search for surgical anesthetics with the first uses of inhaled ether in 1846. This allowed patients to remain sedated during operations ranging from dental extraction to amputation. "A patient has been rendered completely insensible during an amputation of the thigh, regain consciousness after a short interval," Bigelow wrote. "Other severe operations have been performed without the knowledge of the patients." In June 1906, James Homer Wright published an article that described how he stained and studied bone marrow with descriptions of what are now known as megakaryocytes and platelets. In October 1872, a lecture by C.E. Brown-Sequard was published that proposed the then-revolutionary idea that one cerebral hemisphere can influence both sides of the body. The neurologist would go on to describe what is now known as the Brown-Sequard syndrome. In June 1948, Sidney Farber reported promising results in treatment of early childhood leukemia. Based on anecdotal evidence that children with acute leukemia worsened if they were given folic acid, he worked on blocking folic acid metabolism. His team gave 16 infants and children with acute lymphoblastic leukemia a folic acid inhibitor, aminopterin—10 showed improvement by clinical and hematologic parameters after three months. In his article, Farber advised receiving the results cautiously: "It is again emphasized that these remissions are temporary in character and that the substance is toxic and may be productive of even greater disturbances than have been encountered so far in our studies," he wrote. "No evidence has been mentioned in this report that would justify the suggestion of the term 'cure' of acute leukemia in children." In November 1952, cardiologist Paul Zoll published an early report on resuscitation of the heart. "The purpose of this report is to describe the successful use in 2 patients of a quick, simple, effective and safe method of arousing the heart from ventricular standstill by an artificial, external, electric pacemaker," he wrote. "For the first time it was possible to keep a patient alive during ventricular asystole lasting for hours to days. This procedure may prove valuable in many clinical situations." In February 1973, NEJM published the first report of polyp removal using a colonoscope and introduced a procedure during screening to reduce cancer risk. The authors reported on 218 patients, from whom they removed 303 polyps (at one or more procedures per patient). In December 1981, two landmark articles described the clinical course of four patients—first reported in the CDC's June 1981 Morbidity and Mortality Weekly Report—with the disease that would come to be known as AIDS. In April 2001, Druker et al. reported a targeted therapy for chronic myelogenous leukemia. Based on the knowledge that BCR-ABL, a constitutively activated tyrosine kinase, causes CML, the authors tested with success an inhibitor of this tyrosine kinase in patients who had failed first-line therapy. The finding helped begin the era of designing cancer drugs to target specific molecular abnormalities. On April 25, 1996, NEJM announced their new website, which published each week the abstracts for research articles and the full text of editorials, cases, and letters to the editor. After print publishing for 184 years this was the NEJM's first use of the Internet for electronic publication. The website was launched several months earlier in 1996, but the editors wanted proof that weekly electronic publication would work. Only then was an announcement approved for publication on the editorial page. Two years later, online publication extended to include the full text of all articles. Videos in Clinical Medicine, peer-reviewed educational videos to teach procedures requiring skilled techniques and specialized physical examination. Interactive Medical Cases, which mimic a clinical encounter by presenting the patient's history with results of the physical examination and laboratory and radiographic tests. Multiple-choice questions throughout test the taker's knowledge. NEJM Archive, the entire collection of the journal's published material. The journal usually has the highest impact factor of the journals of internal medicine. According to the Journal Citation Reports, NEJM had a 2014 impact factor of 55.873, ranking it first of 153 journals in the category "General & Internal Medicine". It was the only journal in the category with an impact factor of more than 50. By comparison, the second and third ranked journals in the category (The Lancet and JAMA) had impact factors of 45.217 and 35.289 respectively. The New England Journal of Medicine requires that articles it publishes have not been published or released elsewhere. Referred to as the Ingelfinger rule, this policy protects the originality of content. The rule was first described in a 1969 editorial by Franz Ingelfinger, the editor-in-chief at that time. A number of medical journals have similar rules in place. In the early 2000s, the New England Journal of Medicine was involved in a controversy around problems with research on the drug Vioxx. A study was published in the journal in November 2000 which noted an increase in myocardial infarction amongst those taking Vioxx. According to Richard Smith, the former editor of the British Medical Journal, concerns about the correctness of that study were raised with the journal's editor, Jeff Drazen, as early as August 2001. That year, both the US Food and Drug Administration and the Journal of the American Medical Association also cast doubt on the validity of the data interpretation that had been published in the NEJM. Merck withdrew the drug from market in September 2004. In December 2005, NEJM published an expression of concern about the original study following discovery that the authors knew more about certain adverse events than they disclosed at the time of publication. From the Expression of Concern: "Until the end of November 2005, we believed that these were late events that were not known to the authors in time to be included in the article published in the Journal on November 23, 2000. It now appears, however, from a memorandum dated July 5, 2000, that was obtained by subpoena in the Vioxx litigation and made available to the Journal, that at least two of the authors knew about the three additional myocardial infarctions at least two weeks before the authors submitted the first of two revisions and 4 1/2 months before publication of the article." During the five-year period between publication and Expression of Concern, it has been estimated that Merck paid NEJM as much as US$836,000 for article reprints that Merck used for promotional purposes. The journal was publicly rebuked for its response to the research issues in editorials appearing in publications including the British Medical Journal and the Journal of the Royal Society of Medicine. 1 2 Zuger, Abigail (March 19, 2012). "A journal stands out in prestige and longevity". The New York Times. Retrieved June 24, 2014. ↑ Cary, John (1961). Joseph Warren: Physician, Politician, Patriot. Urbana: University of Illinois Press. OCLC 14595803. ↑ "January 1, 1812, table of contents for the New England Journal of Medicine and Surgery and the Collateral Branches of Medical Science". Retrieved December 22, 2011. 1 2 "The Boston Medical Library: A reconstruction of the collection of 1805 and its history". Retrieved December 22, 2011. ↑ "About NEJM: Past and Present". nejm.org. Retrieved December 22, 2011. ↑ Bigelow, Henry Jacob (1846). "Insensibility during surgical operations produced by inhalation". The Boston Medical and Surgical Journal. 35 (16): 309–17. doi:10.1056/NEJM184611180351601. ↑ Wright, James Homer (1906). "The origin and nature of the blood plates". The Boston Medical and Surgical Journal. 154 (23): 643–45. doi:10.1056/NEJM190606071542301. ↑ Brown-Sequard, C.E. ; Webber, S.G. (1872). "The origin and signification of the symptoms of brain disease". The Boston Medical and Surgical Journal. 87 (16): 261–3. doi:10.1056/NEJM187210170871601. ↑ Farber, Sidney; Diamond, Louis K.; Mercer, Robert D.; Sylvester, Robert F.; et al. (1948). "Temporary remissions in acute leukemia in children produced by folic acid antagonist, 4-Aminopteroyl-Glutamic Acid (Aminopterin)". New England Journal of Medicine. 238 (23): 787–93. doi:10.1056/NEJM194806032382301. PMID 18860765. ↑ Zoll, PM (November 1952). "Resuscitation of the heart in ventricular standstill by external electric stimulation". New England Journal of Medicine. 247 (20): 768–71. doi:10.1056/NEJM195211132472005. PMID 13002611. ↑ Wolff, William I.; Shinya, Hiromi (1973). "Polypectomy via the fiberoptic colonoscope". New England Journal of Medicine. 288 (7): 329–32. doi:10.1056/NEJM197302152880701. PMID 4682941. ↑ Gottlieb, Michael S.; Schroff, Robert; Schanker, Howard M.; Weisman, Joel D.; et al. (1981). "Pneumocystis carinii pneumonia and mucosal candidiasis in previously healthy homosexual men". New England Journal of Medicine. 305 (24): 1425–31. doi:10.1056/NEJM198112103052401. PMID 6272109. ↑ Masur, Henry; Michelis, Mary Ann; Greene, Jeffrey B.; Onorato, Ida; et al. (1981). "An outbreak of community-acquired pneumocystis carinii pneumonia". New England Journal of Medicine. 305 (24): 1431–38. doi:10.1056/NEJM198112103052402. PMID 6975437. ↑ Druker, Brian J.; Talpaz, Moshe; Resta, Debra J.; Peng, Bin; et al. (2001). "Efficacy and safety of a specific inhibitor of the BCR-ABL tyrosine kinase in chronic myeloid leukemia". New England Journal of Medicine. 344 (14): 1031–7. doi:10.1056/NEJM200104053441401. PMID 11287972. ↑ Campion, Edward W. (1996). "The Journal's new presence on the internet". New England Journal of Medicine. 334 (17): 1129. doi:10.1056/NEJM199604253341712. ↑ "First NEJM website". Retrieved May 7, 2012. ↑ McMahon, Graham T.; Ingelfinger, Julie R.; Campion, Edward W. (2006). "Videos in clinical medicine — A new Journal feature". New England Journal of Medicine. 354 (15): 1635. doi:10.1056/NEJMe068044. ↑ McMahon, Graham T.; Solomon, Caren G.; Ross, John J.; Loscalzo, Joseph; et al. (2009). "Interactive medical cases — A new Journal feature". New England Journal of Medicine. 361 (11): 1113. doi:10.1056/NEJMe0809756. ↑ Hershey, Edward. "A history of journalistic integrity, superb reporting and protecting the public: The George Polk Awards in Journalism". LIU Brooklyn. Archived from the original on March 28, 2010. ↑ "Media Center: Fact Sheet". nejm.org. Massachusetts Medical Society. Retrieved August 20, 2014. ↑ "Rank in Category: New England Journal of Medicine". 2014 Journal Citation Reports. Web of Science (Science ed.). Thomson Reuters. 2015. ↑ VIGOR Study Group; Bombardier, C.; Laine, L.; Reicin, A.; et al. (2000). "Comparison of upper gastrointestinal toxicity of rofecoxib and naproxen in patients with rheumatoid arthritis". New England Journal of Medicine. 343 (21): 1520–28. doi:10.1056/NEJM200011233432103. PMID 11087881. 1 2 Dobson, Roger (July 15, 2006). "NEJM "failed its readers" by delay in publishing its concerns about VIGOR trial". BMJ. 333 (7559): 116. doi:10.1136/bmj.333.7559.116-f. PMC 1502213 . PMID 16840463. ↑ Curfman, Gregory (December 29, 2005). "Expression of Concern: Bombardier et al., "Comparison of upper gastrointestinal toxicity of rofecoxib and naproxen in patients with rheumatoid arthritis," N Engl J Med 2000;343:1520-8.". Retrieved May 13, 2011. ↑ Lemmens, Trudo; Bouchard, Ron A. (2007). "Regulation of Pharmaceuticals in Canada"". In Downie, Jocelyn; Caulfield, Timothy A.; Flood, Colleen M. Canadian Health Law and Policy (3rd ed.). Toronto: LexisNexis Canada. p. 336. ISBN 9780433452218. ↑ Smith, Richard (August 2006). "Lapses at The New England Journal of Medicine" (PDF). Journal of the Royal Society of Medicine (editorial). 99 (8): 380–2. doi:10.1258/jrsm.99.8.380. PMC 1533509 . PMID 16893926. Retrieved May 22, 2010. ↑ "About NEJM: Online access levels" (PDF). nejm.org. Massachusetts Medical Society. Retrieved October 26, 2011. ↑ "About NEJM: Access from outside the U.S". nejm.org. Massachusetts Medical Society. Retrieved October 26, 2011. Conaboy, Chelsea (June 17, 2012). "You've come a long way, doc". The Globe Magazine (milestones of the NEJM). Müller, Daniel C.; Duff, Ellen M.C. ; Stern, Kathy L. (2012). "Timeline: 200 years of the New England Journal of Medicine". The New England Journal of Medicine. 366 (1): e3. doi:10.1056/NEJMp1114819. PMID 22216863.